Last week I posted about the possibility of renouncing my American citizenship due to the onerous requirements the US government imposes on expatriate Americans. That post broke the record here at Rachel’s Ruminations: the most “hits” ever. And, in the process, I’ve learned a lot more about the situation from the many people who responded, reposted, and generally informed me about it. What I didn’t know was how far the FATCA law goes. 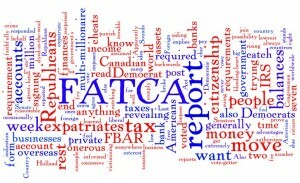 (FATCA stands for Foreign Account Tax Compliance Act.) It requires foreign banks to report Americans’ private bank balances to the IRS, the US tax authorities. This seems incredibly unfair to me: banks in the US are only required to do so if there’s a reasonable indication that a crime has been committed. All they normally report is interest income or dividends, etc., not balances. Also, through the FBAR form, we are required to report our account balances as well, presumably so that the IRS can compare the two reports. Again, residents in the US don’t have this requirement. This implies that we expatriates are assumed to be criminal tax cheats unless we prove ourselves innocent. Sounds a bit backwards, doesn’t it? And never mind any right to privacy! Not only do I end up revealing my own finances, which are none of the government’s business, but I also end up revealing my husband’s finances. He’s not a US citizen, but if I have signing power on an account, I have to report it. But here’s what has surprised me more than anything this week: it’s the Republicans who are fighting FATCA. If you’ve read this blog before, you know that I’m a Democrat through and through: a “bleeding-heart liberal” even. I’ve always voted for Democrats (and, very occasionally, Independents) in the US, and generally vote Green in Holland. It’s extremely rare that I agree with Republicans on anything! Yet, here I am, siding with them. Apparently, the Democrats in the House and Senate are the ones who voted FATCA in. The idea, and a great vote-getter, is catching the fat cats who move their money overseas. The problem is, they’re victimizing the small fry like me at the same time. The $10,000 fine for failure to file the FBAR form, for example, won’t matter at all to a multi-millionaire, but for me it would be hugely excessive and unreasonable. That multi-millionaire they’re trying to catch will have no trouble finding citizenship somewhere else: every country encourages people with money to move in. Then he could move all his assets and businesses out of the US and renounce his US citizenship. The $2350 fee for renunciation is a night at a chic hotel for him. So the IRS won’t get the tax money it wants from him, and the US will lose the advantages of having his assets and businesses reside there. No one wins. The rest of us are struggling with trying to comply. The Republicans Overseas are bringing a lawsuit on our behalf. A group of Canadian citizens is suing the Canadian government for signing a FATCA agreement because of the requirement to report private bank accounts. And the number of renunciations is rising steadily as people move their accounts out of the US, fed up with these onerous requirements. It’s a mistake. If you want to catch overseas tax cheats, find some other way! Don’t punish the rest of the more than seven million expatriates, most of whom just want to live our lives and don’t owe US taxes, or, if we do, we pay them faithfully. In any case, as I pointed out last week, only two countries impose taxes on worldwide income: the US and Eritrea. Country of residence taxation is the norm, and the US should join the rest of the world. People the US is defining as tax cheats are more than likely paying taxes where they live, as I am, which makes sense, given that taxes are meant to pay for the services we receive from the government. If any Democratic Senators or Representatives read this: you’ve actually managed to push a dyed-in-the-wool Democrat to the Republican camp on this issue. There are more than seven million expatriates around the world. We are also your constituents, and it’s time to listen to us! Here’s my more emotional take on the question of renouncing citizenship. Please feel free to comment below, or to share this post! Well done Rachel. Thank you for writing this follow-up on your research into FATCA. Republicans Overseas released a video about FATCA. The sound quality is poor and they muffed the part about form 8938 but their effort is appreciated. Yes, I saw that. It cleared up a lot of confusion for me, even if the presentation isn’t the best. Thanks for posting it for people here who want more information! Welcome to what I call the American Diaspora Tax War of 2012 – ??? I encounter the same phenomenon as you – whenever I write about FATCA the traffic on my blog just explodes. Hi Victoria, I like your name for it! I’ll go read your comments. Thanks for posting here! In the U.S. this is seen as supported by Dems because it was hidden in Dem legislation but, here in Canada FATCA was opposed by the Liberal party, the NDP, The Green Party and the Canadian Civil Liberties Association. The left in Canada pushed back HARD against this craziness which here appears to be very right wing in it’s dogmatic approach as well as the fact that it violates the laws of Canada. So to me it’s indefensible. Yes, its odd to find yourself on the side you usually are vehemently against but, that’s only once you cross that border and look at it from the view of someone doing anything to prop up a party position right or wrong. Things tend to be viewed that way in the U.S. a lot lately so hard to deal with facts. Here in Canada you’re still on the left if you vigorously oppose Bill C-31 that shoved an American law over our border with zero regard to the fact that it violates the Charter of Rights and Freedoms as well as our privacy laws. The law suit in Canada says that Harper does not have the right to trump the Charter of Rights with this so called IGA. Btw, no party in Canada wanted this thing as all knew it did violate our laws but, the U.S. knew this so threatened us with sanctions if we didn’t sign. In past times theatening friendly nations with sanctions like this well, it wasn’t viewed very kindly and I dare say most Canadians are not very happy this was done by the U.S. The U.S. press has been painting this situation as if all these nations are gladly jumping into signing these so called “agreements” It’s not really an agreement if you are threatened into it you know but, it’s certainly not protrayed that way south of the border. The U.S. needs to go to RBT. Too many low and middle income expats simply won’t be able to keep their citizenship and other collateral damages due to FATCA…And you are right, the very wealthy will not be the most impacted. In 2008 I was called a “medical exile” and in 2010 I was called a tax cheat. Both positions were taken to drum up votes with little care for the people actually living as targets. Enough already. FATCA is NOT the way to do this and it IS harming exapt families who have done nothing wrong at all. The more I learn about FATCA and its ramifications the more amazed I am that anyone would support it. And the Band-Aid that the Democrats Abroad are promoting won’t make it much better (a place of residence exemption that would require yet another form, and would still mean violating my right to privacy). I’ve heard that some expats with foreign spouses, like you and me, are removing their signing privileges from accounts in order not to have to reveal their account balances. But that strikes me as increasing their vulnerability generally: if the marriage goes sour, what’s to stop that spouse from running off with all the money? I am agonizing. Exactly 27 years ago that I left a professional career in the US, moved overseas and married a non-American. I became a dependent of my husband while raising a family. Being a Democrat myself, I continued to give support to the Democratic Party and even hosted garden parties for expatriates during Presidential campaigns. I’d voted for Mr. Obama during both Presidential elections and that was a serious mistake. The President and his administration are increasingly blind and deaf. It’s very clear that FATCA is criminalizing American citizens living abroad. In my case, after receiving repeated demands to report our joint bank accounts to the IRS, my angry husband removed my name from the accounts, asserting that all of the money earned was his and he’d already paid taxes. My US passport is a big problem. Two banks in our area have already refused to open an account in my name. Currently I have no bank account, no credit card or debit card. And I can’t drive (following eye injuries in 1975, I became partially blind) How can I continue living in this modern world? My husband’s resentment is hurting me and our marriage is deteriorating. My family in the US had written to a D Congressman on my behalf but the Congressman replied that he had voted for FATCA himself and instructed me to do my tax duty. I’ve concluded that the people who understand the expats’ dilemma are the Republicans, especially Senator Rand Paul, who leads the campaign to repeal FATCA. Members of my family in the US and I are no longer supporting the Democratic Party. All of us are becoming Republicans. I’m not becoming a Republican; I still agree with the Democrats on most things. But maybe I should say I’m neither one since I’ve decided to give up citizenship. I’m going to wait a bit, though, to see if the new Republican-dominated legislature does something about this. I’m pessimistic, though, because this isn’t high on their agenda. I understand your agonizing; it’s a surprisingly emotional decision, even if you mean it just to be a practical one! Thanks for commenting, and good luck in your journey. Thank you, Rachel! I will definitely vote for the Republicans at the next presidential election. Voting for the Republicans means joining their camps, and the person would be labeled as a “Republican” by the old political camp. Not all those labeled as “Republicans” endorse the full range of Republican policies or ideology. I’ve disagreed with a number of Republican positions. But I now find myself disagreeing even more with the Democrats. Hillary will win 2016, if she say she will destroy this stupid law. If not, any republican candidates will win as this is such a lousy law. Anyone with some oversea business or estate will think twice before marrying an american now. I disagree. FATCA won’t be an issue in this campaign, I don’t think. Only expats seem to even be aware of it. And most expats either don’t vote, or if they do vote, their votes don’t get counted. Most places won’t even count absentee votes unless the election is close enough that the absentee votes could make a difference. What I’m hoping is that something gets done about this BEFORE the 2016 election. “Republicans Overseas” are preparing a law suit against FATCA. You may read the the law suit’s outline in their website. So angry, I’ve just written a comment following the article below. It’s about another secret deal between the Democrats and the IRS. Do you think FATCA has received enough notice INSIDE the US to get the new Congress to repeal it before the 2016 election? On FATCA Repeal, Americans living abroad are receiving more support, from inside as well as outside. – Members of the RNC. At beginning, there were 6 members. In July the number went up to 16 (see names on their website). More members of RNC will join the Repeal but haven’t signed up yet because they think while President Obama is still in power, he will veto it. Therefore, they are waiting and will include FATCA Repeal in their agenda during the next presidential election in 2016. – Top US Credit Union group with their own compelling FATCA Repeal proposal. 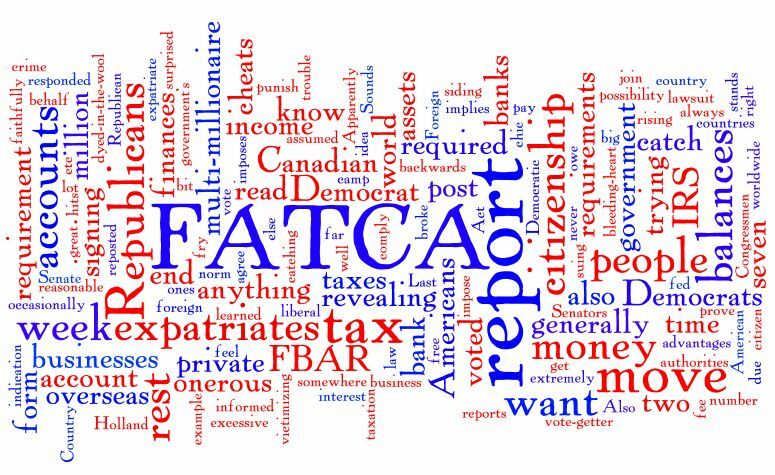 – Leading tax lawyers calling for FATCA Repeal, including James Jatras, Scott Michel, David Rosebloom, Roy Berg. – Nigel Green, founder and CEO of the world’s largest independent financial advisory organizations, De Vere Group. – American Chambers of Commerce (protecting American businesses overseas). – Other groups and individuals. – Maple Sandbox (A gathering for people fighting FATCA, FBAR, and US citizenship based taxation). – Leading institutional law scholar Peter Hogg. – The current law suit by two Canadian women. So you’re saying it won’t happen till after the election? I don’t think they should assume Obama would repeal it. It seems to me it’s something that would give him a chance to show he’s willing to work with the GOP. He’d save the veto for the stuff that’s more important to him, i.e. the ACA. -The Republicans are receiving advice “not to govern” yet. Repealing Obamacare and FATCA before the presidential election may be seen as being too aggressive too soon. It’s very likely that Obama will veto those two proposals and that would weaken the Republicans’ chance of winning the presidential election in 2016. The Republicans are told to concentrate on the big win – taking over the White House. Then repeal. – There is another option if the Republicans want to repeal early: 1/ to repeal part of Obamacare, and 2/ to repeal part of FATCA. Obama may be willing to give his approval. The pressure on FATCA Repeal is mounting. The wise men in the US have great fear that FATCA will cause huge damages to the American economy and lead to the destruction of the US dollars as an international currency. I’m back home in Asia and every day I hear people talk about FATCA and the unbearable costs to banks and other financial institutions to comply. Those banks who have paid huge sums of penalty to the US for non-compliance are very angry. Meanwhile, wealthy Asian people with bank accounts in the United States continue moving their money out of the country, which may trigger a financial crisis in the US (given the current large US national debt). In Texas alone, the foreigners have already moved at least half a billion US dollars out of the banks this year. I was in Singapore and Hong Kong in September and noticed that several countries in the region had already begun to use their own currencies and gold taels in trading (to avoid the US ruling in New York). Some global banks and financial institutions are now actively looking for a new currency to replace the US dollars. Killing the US dollars may take a long time, but the US can’t afford such risk. So, let’s hope the Republicans will choose to repeal FATCA sooner, even just part of it. More than a year ago, Rand Paul had expressed his interest in running in 2016. He is a leading figure in FATCARepeal. Have you checked out Victoria’s site. If this FATCA menace goes on, the biggest losers are the US citizens and eventually USA. That’s a funny way to write about something that’s not funny! I’m glad my daughter is studying in the US now. At least for a couple years she won’t have to file all the extra forms! FATCA has been a serious concern in this Asian region. I think more people talk about it here than inside the US. Two of my friends in Hong Kong have already renounced their US citizenship. When I told them the Republicans have a plan to restore US citizenship for American victims of FATCA, my friends replied that they would no longer care. The President and Ms. Susan Rice just made a brief visit to Singapore during their Asian tour (I only had a bird’s eye view). What he’d signed in Beijing during their three day visit was another shock to my system. The President had said during a press conference after the midterm election that he was going to use his executive power to introduce a series of new laws before January (when the Republicans take control of both Senate and Congress). They are happening. I am embarrassed that I keep expressing my opinions here. But writing about what I am not supposed to know is risky. Unless I have some great news on FATCA Repeal, it’s better that I shut up, at least for awhile. Senator Leader McConnell has announced that he will try to reform various types of taxes inside the US before the presidential election in 2016. No mention of FATCA yet. Will FATCA affect 2016 presidential elections? We all need to email and call our congressman and senator about this FATCA . London Mayor Boris Johnson said he is not going to pay FATCA taxes !!! I heard about that! Do you suppose they’ll attempt to slap a fine on someone who’s that prominent? And when he doesn’t pay up, I wonder what’ll happen? It’s like some kind of warped theater of the absurd! Paul Ryan has just been chosen to carry out tax reforms. We may write our comments about FATCA following this article. If you briefly present your dilemma, I will follow and present my case too. What do you all think? I think writing to representatives and senators is more direct. I’ve already written mine. But go ahead; it couldn’t hurt! I tend to be libertarian but I appreciate the basic Republican money attitude of “I earned it, keep your nose out of it.” Hopefully they succeed. I hope so too! Not in everything, mind you. I am more left-wing, after all. But this was a well-intentioned mistake and needs to be changed. They need to switch to residence-based taxation and then turn their attention to the real tax cheats! I was initially shocked that you would renounce your citizenship, but reading your reasons now I get it. Truthfully, most of the US citizens living here in Canada have threatened the same thing — if the IRS really continues pressuring them for taxation, then they will renounce the citizenship. Like you, many of those people have established their lives outside the US, so other than the benefits of the passport, the citizenship status really won’t affect their daily live. I think that especially when they start enforcing FATCA and word gets out, more people will renounce. And I suspect there are lots of people already on that path; they just need more time to file back tax forms and to save money for the renunciation fee. Anyway, there are plenty more warm places in the world! Sorry to sound a bit thick – but basically is the U.S saying: if you legitimately earn money abroad, i.e. : you’re a teacher of English in another country, then your earnings in that other country are also not only taxed there, but also taxed in the U.S. too? Isn’t there a double taxation treaty? It sounds wholly unfair that your salary should be doubly taxed. And it sounds like punishment for daring to leave the U.S. and want to start a life abroad! Because of treaties between countries, I can file a form to be exempted from US taxes on the first $100,000 or so, so I don’t owe taxes in the US. People who earn more than that sometimes do. The bigger problem comes in countries where some things are taxed differently than in the US. For example, some people end up double taxed on pensions they’ve earned in other countries because the US considers them UNearned income. And the US taxes capital gains after a house gets sold, but capital gains are taxed earlier–while you own the house–in other countries. So yes, people get doubly taxed in some cases, and yes, sometimes it seems that we’re being punished for moving abroad! The first US$100K of annual wages by a nonAmerican employer is exempt from US tax. The problem is that interest paid on bank accounts is taxable. In some cases, all of the tax paid to a foreign government can be credited against US tax liabilities, but I can assure that that does not work for me at all. Moreover, US citizens who are expats have to file a return even if they owe no tax. It is a criminal offence not to file a return even when no tax is owed. The main problem with FATCA is that the IRS is asserting a right to demand private information from foreign financial firms. A number of banks around the world have expelled the US customers they know about, and are not taking new customers who are American citizens. Contrary to much of the information on this blog, FATCA was a bipartisan effort from the start as indicated by the idea starting with Nixon and McCain being a co-sponsor of the legislation. Republicans, including Republicans Abroad, are grand-standing to make a political issue of it. The Paul/Bopp law suit is ill conceived and has little chance of success. Really? I didn’t know that. But does it really matter whose idea it was? The idea, as you say, was to grandstand by going after those evil tax evaders. The question is if we can make either party see that we “little people” are getting caught in a net that isn’t intended for us! I have been an expat American for 21 years, and am married to an American. If I renounce my citizenship, I lose my right to receive USA Social Security while living abroad. That’s a deal killer for me. FATCA was passed in 2010, when Democrats controlled the White and both sides of Capitol Hill. My hunch is that a repeal of FATCA is not a GOP priority. The problem goes back to 1970, when Congress passed a law requiring that foreign bank accounts be disclosed to the IRS when the largest balance during the year exceeded 10K. No allowance was made for genuine expats. The law also covers foreign brokerage accounts and retirement plans. The problem is that the 10K floor for having to report to the IRS has never been raised since. The floor should be raised to 250K, better yet to 500K. The USA signed a bilateral agreement with my country of residence, such that FACTA information requests always go to the income tax authorities here, and never to commercial banks. I am in compliance with FATCA, a nontrivial matter. I have a strong suspicion that the US Treasury is not interested in us expats, but won’t admit that fact, and is only interested in suspected big tax evaders, drug dealers, and hiders of ill gotten gains. US income taxes are lighter than those of nearly all other first world countries, and this is especialy true for income from stocks and mutual funds. Most people who invest overseas are paying more income tax to overseas jurisdictions than they would owe the IRS on similar investments domiciled in the USA. I have filed a USA tax return every year I have been abroad. That return is complicated, but leaves me owing not much. The problem is there is now an information sharing agreement between the USA and my country of residence. Which means that my country can find out the $150 of interest my wife gets on a credit union account, that I declare to the IRS. The IRS can find out the US$1200 of interest we get on local bank accounts. On that interest I pay US$125 of local income tax. But Form 1116 allows me to claim only US$6.50 of that $125 as a credit against my US income taxes. So much for no double taxation. The information sharing agreement required that I come clean to the local authorities about my USA mutual funds. While local income taxes are vastly simpler than the USA, that is not the case for foreign mutual funds, whose taxation is so complex that I have my local return done by a partner with a well known multinational accounting firm. He is friendly and competent, but charges $300/hour. Thus investment activities that generate around US$1000/year of USA tax liabilities, generate around US$20K in local tax liabilities. For reasons that would take me to far afield, I cannot credit the $1000 I pay the IRS against that $20K. The country I live in agrees to defer income tax only on IRA and 401k balances accumulated while one lived and worked outside the country. The local taxation of USA Roth and Coverdell accounts has yet to be determined. Each country has different tax law, and each country has a different intergovernmental agreement with the US. It gets so complicated that it’s no surprise everybody’s worried that they might get it wrong and end up getting huge fines from the IRS! I think your first statement, though, is incorrect. You should check that. My understanding was that you can receive Social Security overseas, but that they’ll tax it 30%. Too late for me! I’ve already renounced. I’m sure there are plenty of others who could do it. I’m still sceptical they’ll actually repeal it. It would be too easy for the dems to accuse them of being soft on tax cheats and they’d bargain it away. I hope I’m wrong. Vote … as a Non-Citizen? Really?